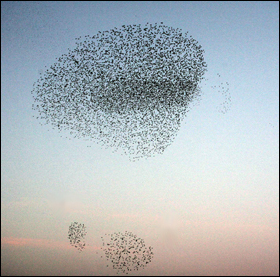 A flock of starlings exhibiting collective behavior. A new four-year collaborative project, devoted to the investigation of principles and algorithms that underlie purposeful collective behavior in natural and engineered systems, was initiated this summer. It is an AFOSR-supported joint effort involving P.S. Krishnaprasad (ECE/ISR) and Andrea Cavagna of the Institute for Complex Systems, of the Italian National Research Council. Building on their separate prior contributions, Krishnaprasad and Cavagna have launched an intense program of research in natural flocks and swarms of birds and insects. The research is aimed at discerning the underlying principles, working out models and algorithms to create quantitative support for the extracted principles, and exploiting the resulting understanding, as codified in models and algorithms, in the design, implementation and verification of robust, distributed, cooperative, survivable control systems for swarms of autonomous robots. A variety of tools from geometric and optimal control theory, statistical physics, graph theory, and large-scale data analysis coupled with empirical observations, will be brought to bear on problems of collective behavior, to elucidate the scientific foundations of the subject, and realize applications to robotics.